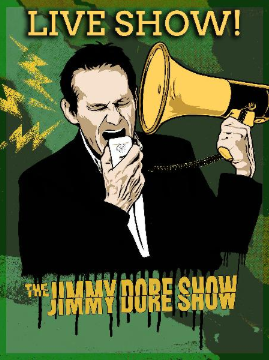 Jimmy Dore is an American comedian who has been performing stand-up comedy for 19 years. He was born and raised into a catholic family of 12 on the southwest side of Chicago, Illinois. Jimmy is the star of several Comedy Central specials, and a writer performer for the Off-Broadway hit “The Marijuana -Logues”, His latest effort “CITIZEN JIMMY” a one hour Comedy Central Special currently airing was chosen BestOf2008 by iTunes, and was named one the the Top 5 Comedy DVDs of 2008 by Punchline Magazine.